I hope tomorrow is filled with joy for all of you. in my office lost their jobs because of outsourcing. taking breaks to spend time with people I love. and I'll see you in 2014! I’m a fan of Roach’s writing. She manages to take any subject and make fascinating and hilarious. The alimentary canal is no exception. Roach begins with the mouth and follows the path of food all the way through the process. The results is a book that is both absorbing and disgusting. I definitely enjoyed the first half more than the second. It turns out my threshold for reading about poop is lower than I might have guessed. BOTTOM LINE: Interesting, gross, funny; I learned a lot. Definitely don’t listen to it at work or around your grandparents! A young girl, April, moves into a new neighborhood after her actress mother decides to leave her with her grandmother. April finds a kindred spirit in her neighbor Melanie when they realize they are both fascinated by Egyptian culture. They create a game based on their interest and soon other kids join in the fun. All the while a local tragedy has everyone on edge. I think I probably would have loved this one as a kid. Unfortunately I just read it for the first time. I still enjoyed it, but the fantastical elements of creating a world from your imagination wasn’t quite as powerful as an adult. I loved that this story encourages kids to use their imaginations instead of relying only on TV and set games for entertainment. Embracing a different culture and learning about their traditions is a great lesson as well. BOTTOM LINE: A good kids' chapter book with a few scary parts. A great focus on using your imagination. This is a fictional account of General Sherman’s march through the South during the Civil War. It covers the issues of freed slaves, captured Confederate soldiers and abandoned plantations. The main problem I had with the book is that there’s no grounding center to the story. We get a glimpse at the lives of many people in the south, but we don’t really get to know any of them. We spend the most time with Pearl, a young African American girl named Pearl whose skin was so light that she passed for a white drummer boy. She’s an interesting character, but I never felt like we got to know her or any of the other characters very well. BOTTOM LINE: I wanted more, more depth in the characters, more historical details, etc. The book felt like it barely skimmed the surface and I was never invested. It’s time for an end of the year survey! I love doing one of these each year because it makes me really reflect on the books I read over the past 12 months. I love remembering favorites from January and February that I may have forgotten. Any books I re-read this year are not eligible for this list. Otherwise my favorite books and characters each year would probably be ones from previous years. The Moonstone by Wilkie Collins, I loved The Woman in White, but honestly I’ve been trying to read this one for 3 months and I just can’t get into it. Where'd you go, Bernadette, I thought this one would be a quick fluff read and I ended up loving it. It was funny but it also had a depth I wasn’t expecting. Game of Thrones, I’m two books in and loving it. Laurie R. King (The Beekeeper’s Apprentice) and Italo Calvino, I can’t wait to read more by both of these authors. A Good Man Is Hard to Find, I’ve never been a huge fan of short stories, but this one was so good! Divergent, I read it in one night and started the second one immediately. The Night Circus, hands down I will definitely be re-reading it. Mattie Ross from True Grit; there are others but Mattie immediately came to mind. Native Son; I thought about this one for weeks after finishing it. It’s a heart wrenching look at the racial divide in America and it was written in the 1940s, when those issues were often taboo. Cold Sassy Tree, such a wonderful classic! The Game of Thrones series, I keep wanting to discuss the differences between the books and the show with people. Tell the Wolves I’m Home, great recommendation! Four from the Divergent series. The Night Circus; oh my gosh how incredible was the circus! I’m going to break my own rule here and say that re-reading the Harry Potter series with a friend was so much fun! The Green Mile; seriously John Coffey and Mr. Jingles, lots of tears. I loved this book. The Poisoner's Handbook; it’s a nonfiction book about forensic medicine during the jazz age. I thought it was fascinating! I finished the TBR Pile Challenge, the Back to the Classics Challenge and the Let’s Read Plays Challenge. I also put a big dent in my Classics Club list! Dombey and Son by Charles Dickens; this was the first time I haven’t read a new Dickens book. I’m disappointed I didn’t get to it, but I definitely will in 2014. Landline by Rainbow Rowell (July 8, 2014 release), can’t wait! I’m finally having a profession redesign my blog done. I am planning to launch the new site whenever it’s ready in 2014! Right at the end of World War II a ship left from San Francisco carrying pieces of the atom bomb. The secret mission was an important one, crucial to ending the war. A lack of shared information and an unexpected Japanese submarine led to the torpedoing and sinking of the ship. 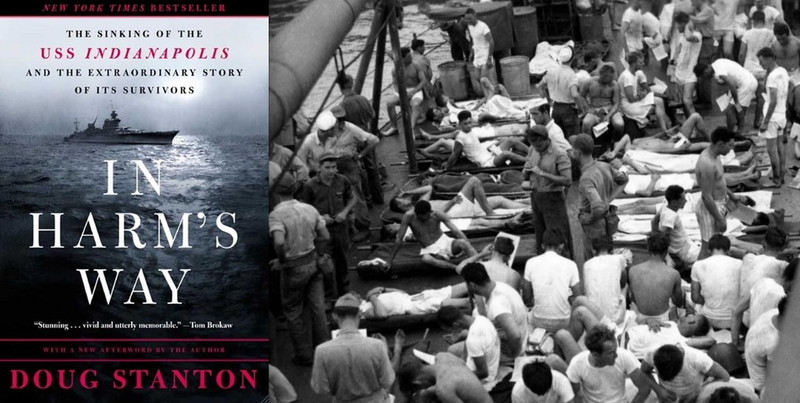 The story of the USS Indianapolis became famous after a scene in Jaws viscerally described the horror the men experienced. This is nonfiction at its best. The book sweeps you into the story immediately. It moves fast, hooking you and breaking your heart with every page. Trapped in the water, surrounded by sharks and without any drinkable water, the men began to drop like flies. It’s horrifying to read about what the men in the water experienced. Some hallucinated, others gave up, and some fought to save their fellow men by giving them their life vests or diving off rafts to save someone. 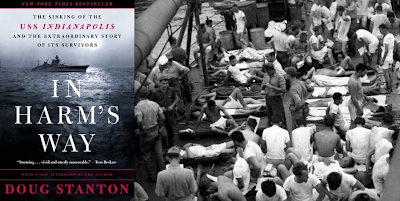 There were shark attacks, men drank the salt water out of desperation, others were burned badly when the ship was hit and were forced to sit in the water as their wounds festered. There were 1,196 crew members on the ship when it was torpedoed and only 321 survived, four more died in the weeks following. Those are not good odds. The book also deals with the charges brought against the captain of the ship and how they affected him. There’s something particularly terrible about going through a trauma like that and knowing that it’s still not over when you get out of the water. BOTTOM LINE: Just fantastic. If you enjoy good nonfiction, war stories or anything along those lines I would highly recommend it. It’s similar to Unbroken, but in my opinion was even better. Photo of the survivors from here. 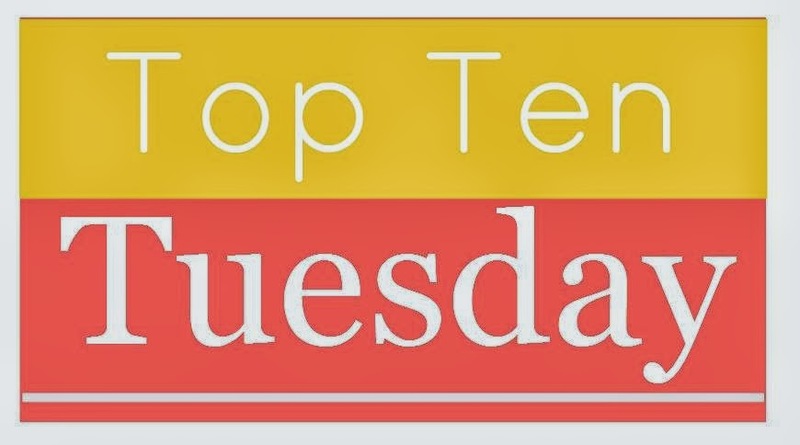 This week's Top Ten from The Broke and the Bookish asks Top Ten New-To-Me Authors I Read In 2013. The following are all new ones I was thrilled to discover. I’ve already got a second book or two in the queue for 2014 from some of them. The seven have finally all met and set off on their adventure. The first two books in this series build the necessary relationships for these important meetings. Finally Percy and Annabeth are reunited and their new friends and fellow demigods: Leo, Hazel, Jason, Piper, and Frank embark of a quest to find the Mark of Athena. Their adventure takes them to Rome where they must tackle some of their greatest fears. The gods are thrown into a debilitating confusion by the earth god Gaia when their Roman and Greek identities begin to vie for dominance in their own minds. Very few gods (mainly only those dealing with Love, Revenge and Wine) are immune to the differences between the way the two cultures view them. This addition to the series is action-packed but also contains some great information about how the gods are personified in different cultures. There’s also one section that’s particularly funny when the group has a run in with Narcissus. BOTTOM LINE: The books are formulaic but fun. I feel like we’ve gotten to know these characters and I’ve grown attached to them. I can’t wait to read the next book in the series. I struggled with this one. The main character, Stephen, is sent to a small Japanese town to recover from tuberculosis in 1937. He’s a young Chinese man and during his stay he finds himself getting to know the past through the family’s servant, Matsu, and dreading the future approaching war. Stephen doesn’t make an interesting character. His dialogue and actions fall flat, but it’s the supporting cast that eventually hooked me. Matsu is an older man now, but in his youth leprosy swept through their small town. He lost his sister to the disease and has watched a sweet friend, Sachi, suffer from it for years. Matsu and Sachi were lovely characters and the book is well worth reading for their plots. BOTTOM LINE: Despite an incredibly slow start, the supporting cast makes the story an interesting read. This is a nonfiction memoir about Abbey’s time as a park ranger at Arches National Park in Utah. Abbey is a bit of a curmudgeon, ranting about the destruction tourists cause in the park. That’s the strange paradox of wilderness; the more people want to visit it the more likely it is to be tainted by their presence. The wild aspects of nature are destroyed as roads are built for the public to reach them. It reminded me so much of Thoreau’s Walden. Both men live on their own, apart from society for the majority of each day. They write about their reflections of both the nature that surrounds them and the structure of the world in which they live. It’s hard not to sound a bit pious when you’re in that position, but some of his descriptions are beautiful. BOTTOM LINE: A good travel memoir and reflection on society, but I have a feeling I would have enjoyed this one much more if I’d been traveling in the West or even planning a trip there. It’s hard to appreciate the incredible nature of the west when you’re just reading about it. 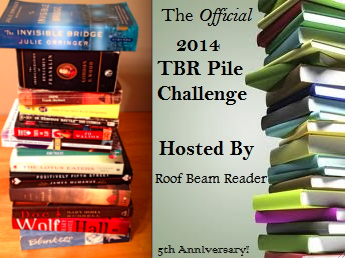 The Roof Beam Reader (Adam) is once again hosting the TBR Pile Challenge. I am pretty picky about what challenges I participate in, but I love this one because it encourages me to read books I already own. To finally read 12 books from your “to be read” pile (within 12 months). Each of these 12 books must have been on your bookshelf or “To Be Read” list for AT LEAST one full year. Caveat: Two (2) alternates are allowed, just in case one or two of the books end up in the “can’t get through” pile. Photo by moi and from Adam's blog. Is it possible to have a book make you laugh out loud and break your heart at the same time? Judd Foxman is about as low as he can get. His wife is having an affair with his boss and his life is completely upside down. At this vulnerable moment he finds out that his father has just died after a long battle with cancer. He returns home to sit Shiva with his mother and siblings for seven days. BOTTOM LINE: Once you get past the laughs and awkward family situations the book is really about dealing with grief, forgiveness and finally growing up. The message is a good one and the novel is well written. 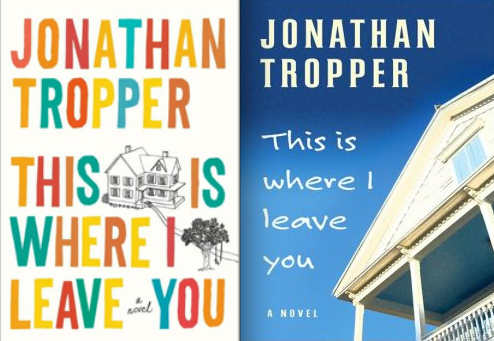 I really enjoyed it the whole time I was reading it and can’t wait to check out more from Tropper. Pair with the TV show Arrested Development. Nothing quite matches the hilarious family dysfunction of the Bluths. The first two seasons are particularly great. The Tull family, led by demanding matriarch Pearl, is made up of a mishmash of three very different siblings. There’s the competitive and insecure eldest, Cody; the eternal optimist and quiet-natured Ezra, and Jenny, determined but cautious. The story is told in such compassionate detail from the perspective of each person in the family in turn. The rotating narrative takes us through their lives giving us a peak into the way each one thinks. I wasn’t a fan of Tyler’s after The Accidental Tourist, but this novel changed my mind. It’s reminiscent of other novels about dysfunctional families (As I Lay Dying and This is Where I Leave You), but it’s also wholly its own story. The father figure is absent and the lonely life they lead is rarely intruded upon by others. Tyler’s skill as a writer makes even the unsympathetic characters become relatable. You may not like them or what they’re doing, but you can somehow understand why they’re doing it. BOTTOM LINE: A beautifully written story of a family that both desperately needs each other and can hardly function together. Just beneath the surface there is so much hurt, jealousy and resentment, but there is also a cord of similarity and shared experience that holds them all together. A wonderful book with characters that felt achingly real. **This book came highly recommended from both Jeanne and Adam and once again they were right! Everyone is posting about Setterfield’s new book right now and it got me thinking about her first novel. I read and loved the book in 2007 and decided that the R.I.P. Challenge was the perfect excuse to reread it. A reclusive and prolific author, Vida Winter, is notorious for fictionalizing her past. Then she contacts an amateur biographer and bookseller, Margaret, requesting the chance to tell the real story of her life. This gothic mystery has all the ingredients to be a great book and it has the writing to back it up. The reason this book is so intoxicating to readers is because it celebrates reading and weaves a love of books into every page. There are references to specific books and the joy of reading that any bibliophile can relate to. 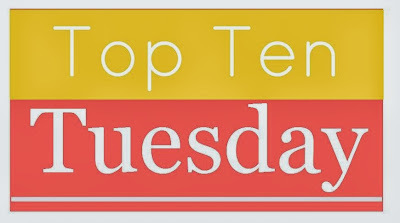 The author’s love of Wuthering Heights, Turn of the Screw, Jane Eyre and others is clear in every line which immediately puts the readers who love those books on her side. On top of that there’s a delightfully gothic mystery in the style of Daphne du Maurier and Wilkie Collins. The combination of elements reminds me of another favorite of mine, The Shadow of the Wind. There’s no need to delve far into the plot, it’s too much fun to discover that world on your own. There’s a creepy English house, twin girls named Adeline and Emmeline, and a fire. BOTTOM LINE: A book lover’s dream. If Rebecca, The Woman in White, or Kate Morton’s novels make you swoon then this one should be a must for you. Each year Sarah Reads Too Much hosts the Back to the Classics Challenge. I need very little prodding to read classics, but I always participate in this one because I love the categories she comes up with! I completed the challenge and below are my books with links to each review. I earned three entries by finishing all six main categories and the six optional categories. 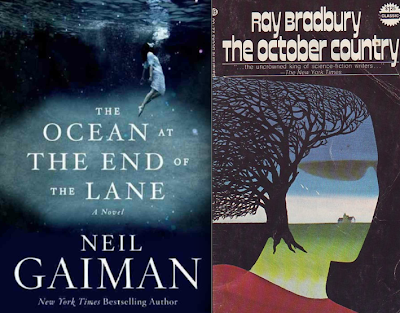 I read some really fascinating books for this challenge. I encountered Hemingway in the unexpected gender-bender The Garden of Eden and comtemplated solitude with Thoreau in Walden. I considered the morality debates in The Brothers Karamozov and the impact of societal expectations in Native Son. It really was a wonderful collection of books! I’d like to say a huge thank you to Sarah for hosting this. It’s a lot of work to coordinate something like this. She even has individual pages for each category to link up, etc. I’m a list maker, so I love being able to check these off my list as I go through the year. Thank you Sarah!